Coca-Cola Freestyle, the Coca-Cola Company’s new interactive fountain dispenser, is available for the first time in the Dallas area. Long-time Coca-Cola customer Wingstop, the fast-growing chicken-wing restaurant concept that has sold more than 1.9 billion wings, will be the first to offer the fountain in the Dallas area. Wingstop plans to feature Coca-Cola Freestyle in three of its locations this summer. Units will be installed in 25 additional Dallas-area restaurants later this year, including select Boston Market, CiCi’s Pizza, DoubleDave’s Pizzaworks, Pei Wei Asian Diner, Schlotszky’s, Souper! Salad!, Taco Bueno, and Which Wich? locations. The sleek, stylish new fountains are touch-screen operated, enabling consumers to select from more than 100 regular and low-calorie beverage brands—including many varieties of waters, fruit-flavored beverages, and sparkling beverages that have never before been available in the U.S. other than on Coca-Cola Freestyle. The self-serve fountains—which represent a complete departure from anything the Coca-Cola Company has offered previously—have been in development for more than four years. “We have created a concept that is quickly becoming recognized as the soda fountain of the future—the way people will experience Coca-Cola beverages years from now,” says Gene Farrell, vice president of Coca-Cola Freestyle for Coca-Cola North America. Early testing of the fountains began a year ago and expanded to include more than 50 restaurants across Georgia and Southern California. Results from the test indicate an increase in total restaurant sales—including fountain servings—as well as a measurable lift in traffic. The company plans future testing in other cities as early as the fall. 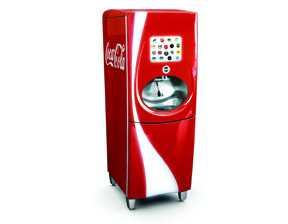 The Coca-Cola Freestyle dispenser uses unique, proprietary PurePour Technology and has the capacity to dispense up to 106 branded beverages in the same footprint as a standard eight-valve machine.